Crazylegs could have been the greatest organist in the world if his fingers hadn't been too short. The Airborne Rangers don't care how perfectly you can play Bach's Toccata and Fugue in D Minor, they're only concerned with your willingness to jump out of a helicopter into a hot LZ with nothing but a rifle, a couple of grenades, and the best wishes of your commanding officer. 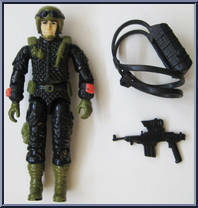 Crazylegs is Airborne Ranger qualified and has been cross-trained as a forward artillery observer. "Night Force operates stealthily in environments where the team is usually outnumbered and outgunned. Darkness is their best defense, only until the first shot has been fired! Once the team's presence and position has been compromised, it's up to Crazylegs to provide enough firepower and confusion to cover a tactical withdrawal. He loads "100%" tracer ammo instead of the usual 1 to 5 ratio. This makes the other guy think there are twice as many out there coming at him!" Contribute pictures, update details or suggest corrections for Crazylegs. Write a review about Crazylegs.